The mini Next Generation Canadarm prototype, suitable for orbital refueling (Credits: Canadian Space Agency). After three years of development, prototypes of the Next Generation Canadarm were unveiled on September 27 by MacDonald, Dettwiler and Associates (MDA). 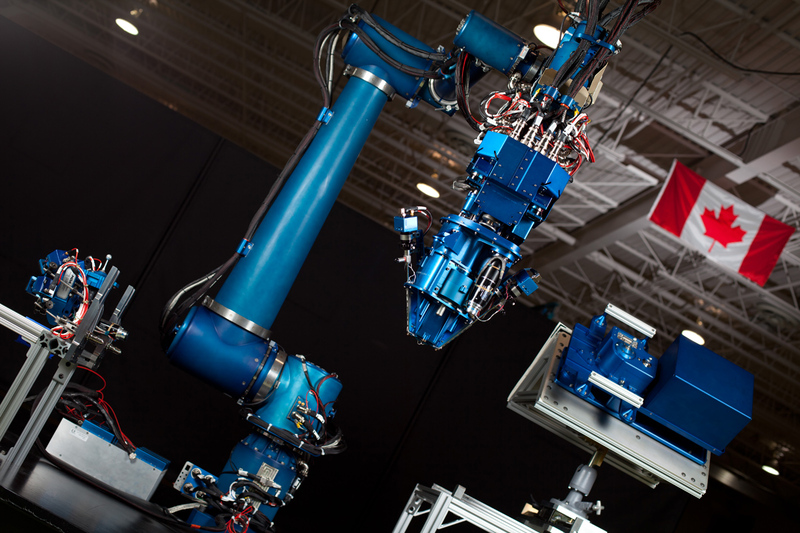 The robotic arms were commisioned by the Canadian Space Agency (CSA) for $53.1 million. “We prepared all these new systems so that we will be well-positioned for the next thing in space,” said Gilles Leclerc, the CSA’s director-general of space exploration. The prototypes are terrestrial models, not ready for deployment to space. One of the arms is the same length as the International Space Station’s Canadarm 2, 15 meters, but is lighter and can be telescoped for storage or launch. Another prototype is 2.58 meters, a miniature unit modelled on the station’s Dextre robotic manipulator, suitable for refueling satellites and handling tools. The NGC project initially began with the idea of once again supplying NASA with a robotic arm, this time for its new Orion spacecraft. MDA provided the four units of the original Canadarm that flew on the Space Shuttles, as well as the second generation Canadarm2 that grapples cargo ships and assists with spacewalks on ISS. There is some thought that CSA may leverage the NGC to launch its astronauts on NASA’s Orion. “Canada used its contribution of robotic arms for the shuttle and the International Space Station in terms of a swap, if you will, of Canadian technology for the placing of Canadian astronauts on those missions,” said Anthony Salloum, space adviser for the think tank Rideau Institute at the project’s launch. It seems clear that the Canadian Space Agency has something similar in mind for the NGC. But the agency and MDA are also looking beyond NASA this time. They see commercial potential for a robotic arm that can assist in refueling of orbital spacecraft and possibly a lunar lander mission in Canada’s future – or they did before CSA’s budget was slashed this year. Where funding priorities for the agency will now fall, and how the new Canadarm fits into that picture, remain to be seen.